As we continue to expand the great set of online productivity tools available to Office 365 users, we are committed to improving the experience that ties these services together. Today, we’re announcing a new version of the Office 365 App Launcher, which will provide improved discoverability to new and recently used apps, additional customization options and search across all the services and applications you use in the Microsoft Cloud. With one in seven people on the planet using Office, it’s important for us that this new experience feel familiar while also improving access to mission critical applications from across your organization. The Office 365 App Launcher has always provided a simple, consistent experience to surface applications when and where you need them. Now, we’re taking this one step further and helping bring the apps you use most front and center. 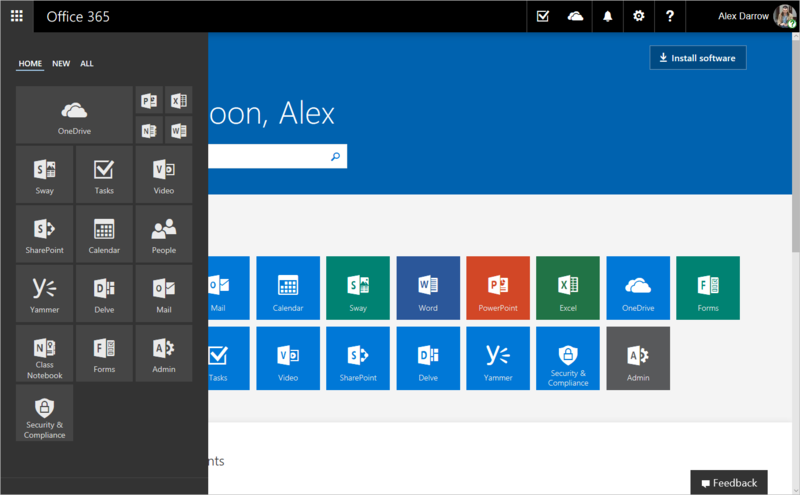 The new tabbed layout allows you to pin and organize tiles in a “HOME” section to provide fast, familiar access to your favorite apps from your Office 365 subscription, the Office Store, Azure apps, SharePoint apps, Line of Business apps and even custom tiles added by organization administrators. Your company’s recently added apps also get their own “NEW” section, with badge notifications to let you know when a new app is available. We’ve also brought the “ALL” apps page directly into the App Launcher experience to give you quick access to your entire catalog of applications and search from anywhere within Office 365. We also expanded the core functionality of the App Launcher to allow you to resize and organize tiles. These features mirror the familiar look and feel of the Windows 10 Start menu to make switching between applications as seamless as possible. To further enhance the speed at which users can multitask, you can continue to pin up to three applications to the right side of the navigation bar. 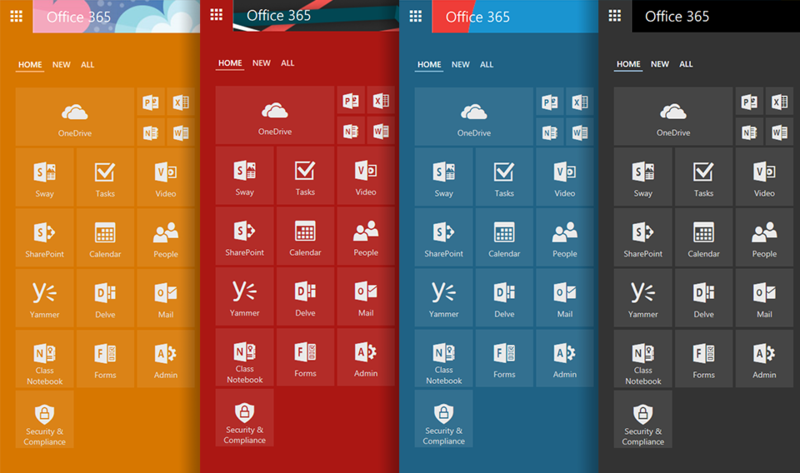 The redesigned App Launcher now supports Office 365 themes, including your company’s custom theme. Simply select an Office 365 theme from the Settings menu and see the color scheme reflected throughout the new experience. We’re working hard on exciting new features for the Office 365 user experience. Over the coming months, you’ll see the ability to access your recent files from across Word, Excel, PowerPoint and OneNote Online simply by clicking the icon’s ellipsis menu. This will help you pick up from where you left off more efficiently. As we continue to turn your feedback into reality and imagine new scenarios for working, we always want to hear your thoughts. You can always share your thoughts through the Feedback link at Office.com or in the comments below. Q. When will I see these features in my Office 365 environment? A. Customers who have opted into First Release will see them later this month. Others will start to see the update in October. Q. What apps will be available in the App Launcher? A. The App Launcher will display apps from your Office 365 subscription, the Office Store, Azure apps, SharePoint apps, Line of Business apps and custom tiles. Q. Will I be able to customize my App Launcher? A. 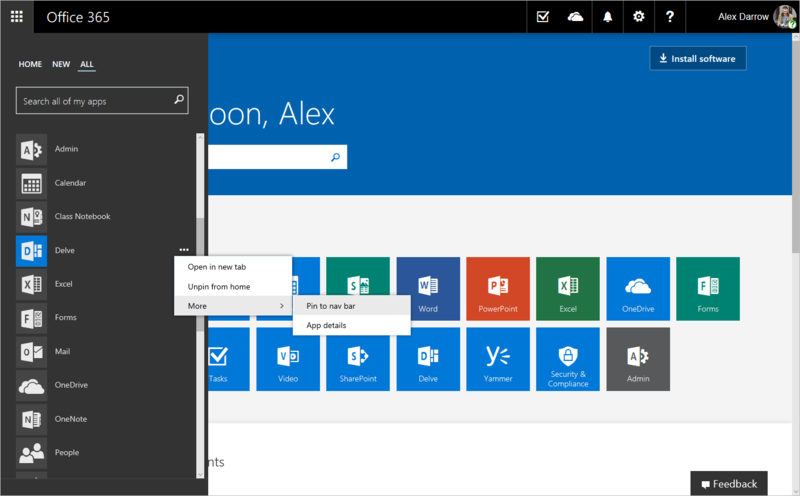 Yes, however only customers with Exchange will be able to pin, resize and customize tiles. Q. Why can’t I see the new tabs? A. Only customers with Exchange will see the tabbed layout. Q. Can administrators customize the HOME section of the App Launcher on behalf of users? A. Not yet. We are currently working to enable greater control for Office 365 administrators. Please check back soon. Q. How do I get additional apps? A. Additional apps are available from the Office Store. Q. What if my organization uses a custom theme? A. Your organization’s theme will be reflected in the new App Launcher. Q. Are there any resources available to help me communicate this change to end users in my organization? A. Yes, there is an email template available on Office 365 FastTrack to communicate this change. This email is designed for you to send to your organization on the rollout of this new feature and includes customizable surfaces to reflect your organization’s brand and resources. A. Yes, there is an email template available to communicate this change. This email is designed for you to send to your organization on the rollout of this new feature and includes customizable surfaces to reflect your organization’s brand and resources.